Looking for Cyber Monday flight deals and amazing discounts before the year ends? We’ve got you covered! We partner with over 1,200 airlines, hotels, car rental companies, and travel agencies to bring you direct access to the best Cyber Monday travel deals. Many airlines & online travel agents run exclusive deals on their site. We’ll round up all the best deals here as Cyber Monday approaches, so you don’t need to search the entire internet for a deal. Delta Air Lines Flight Deals – Delta has an a Cyber Monday flight sale that runs until 11.59pm ET on Wednesday November 28. Domestic fares start at $109 each way and international fares start at $629. Visit this page for latest flight deals from Delta. United Airlines Flight Deals – United has announced that for today only, Cyber Monday, Chase cardholders can get up to 50% off and non-cardholders can get 40% off. Book today for travel between January 13, 2019 and March 28, 2019. Go here for the best flight deals from United Airlines. Aeromexico Flight Deals – Cyber Monday discounted deals include Las Vegas to Merida ffrom $329, Seattle to Cancun from $589, Chicago to Cabo from $329. Trave by March 31, May 31 on selected routes. Cathay Pacific Flight Deals – The Hong Kong-based airline is offering discounts off many of its economy and business-class fares. Fly from Los Angeles, San Francisco, Chicago, New York, Washington DC, Boston, Seattle to Bali: Denpasar flight round-trip as low as $632. Book by November 27. Iberia Black Friday Flight Deals – This year, Iberia is celebrating Color Friday with hotel deals up to 20% off, car hire for 30% off, and special flight deals to Spain and Tel Aviv. The deal starts November 21 and ends November 26, 2018. Norwegian Flight Deals – In addition to specific route discounts, Norwegian is offering 30% off on short-haul flights, and a 15% discount on long-haul flights. Buy your tickets here to take advantage of the best possible fare, then use the code EVERYROUTE18 to claim your discount. Offers are good through Monday, November 26th, at 11:59 PM, EST. Singapore Airlines Flight Deals – Discounts on flights to destinations including Singapore, Hong Kong, Tokyo, Frankfurt and Manchester. Book before November 28. Southwest Airlines Flight Deals – Southwest is offering discounts on domestic one-way flights for Cyber Monday. Cheap tickets start from as low as $49. Emirates Flight Deals – Emirates is running a Cyber Monday sale until November 30 at 11:59 pm EST with deals that include $979 round-trip economy fares to Bangkok, and $829 round-trip fares to Dubai. LOT Flight Deals – Receive a 10% discount on all flights to Budapest and Poland when you enter in promo code: BLACKFRIDAY10 at checkout. Virgin Atlantic Flight Deals – Cyber Monday deals are on now available online. Book your return flight from the United States now for as little as $336. This offer is good until midnight on November 27th so act fast! Air France Flight Deals – Air France’s Black Friday/Cyber Monday sale runs through November 28, and applies to travel between January 16 and March 15, 2018. TAP Portugal Flight Deals – Save an extra 50% on eligible flights listed on TAP’s MilesOnly and Miles&CashOnly membership listings when you book your flight with earned miles by November 27th! Allegiant Flight Deals – On Cyber Monday only, the Las Vegas-based airline will offer up to 40 percent off airfare, triple upgrades on rental cars and a third night free on vacation packages. Vueling Flight Deals – The Barcelona, Spain, airline has 200,000 discounted tickets to European destinations with prices starting at $13. South African Airways – $699 round-trip fares from New York and Washington, D.C. to Johannesburg as part of its Gratitude Sale, which runs through Tuesday, November 27. The deal also includes $759 round-trip fares from New York and D.C. to Cape Town, plus discounted fares from D.C. to Accra and Dakar. When is the Best Time of the Day to Book Cyber Monday Flights? Based on data from 2017, we predict the cheapest prices will be available at 2pm. The most expensive flights were at 9am last year. 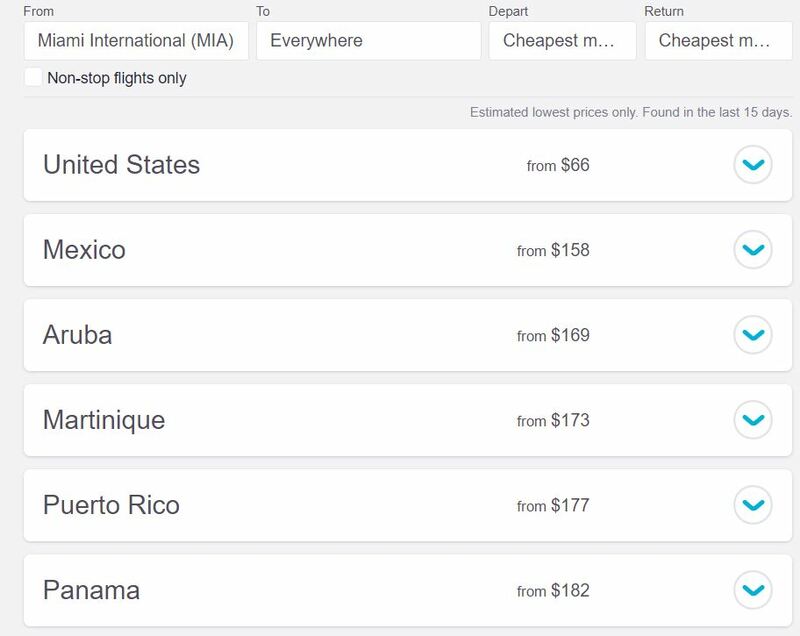 Below are the cheapest domestic & international destinations for Cyber Monday flight deals based on 2017 data. Here are the top 10 domestic and international destinations that we expect will have the best Cyber Monday deals. If you’re new to Skyscanner, we’re going to share a secret with you. Finding the best flight deals (including Cyber Monday travel deals) is easy. Start by entering your home airport. Enter ‘Everywhere’ as the destination. 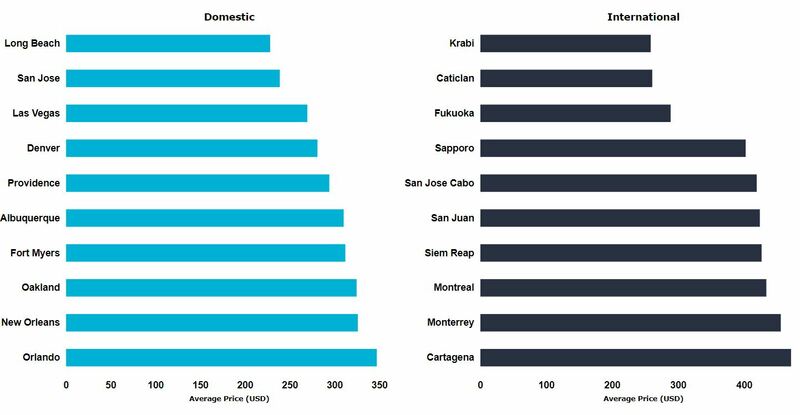 You’ll be prompted with a list of the cheapest countries you can fly to. Choose your destination and select a city you’re interested in; we’ll show you the cheapest dates available. You can also find Cyber Monday Flight sales by downloading the Skyscanner App and clicking “explore” to find all the best deals from your home airport. We already did some searching to inspire you. Below are some of the best travel deals available right now. We’ll be updating this regularly, so be sure to check back later for the best Cyber Monday travel deals. Travel plans not flexible? Price Alerts are the best way to keep informed about Cyber Monday flights to specific destinations. Downloading the app is the best way to get instant notifications when flight prices drop. 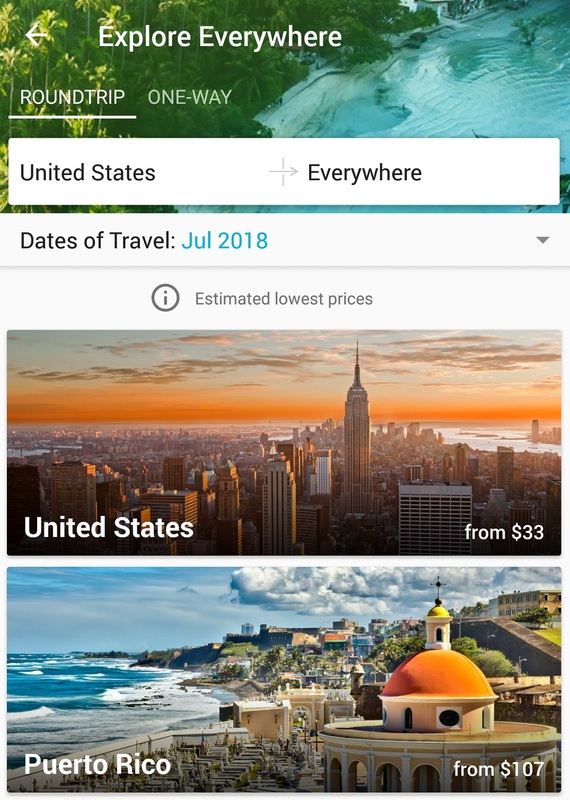 Download the app before Cyber Monday to set up Price Alerts to all your favorite destinations. Then you’ll get notified of Cyber Monday flight deals on your desired routes. When you set a Price Alert on Skyscanner, we’ll send you a push notification to alert you when the price changes on Cyber Monday. Are Cyber Monday Travel deals worth it? Taking advantage of Cyber Monday airfare deals (or any airfare deal) requires a certain amount of flexibility. The best travel deals require you to be open with your dates and your location. If you’re looking for a travel deal that will get you to a specific location during set dates, it’s probably not going to happen! At any given time, there will be airline deals available, but you’ll need to be completely flexible. If you’ve found a deal you like now, it’s usually worth booking it right away since most travel deals will be under a limited availability and you will not be the only person interested in booking!